Who’s afraid of Occupy Mendiola? Noynoy is. Malacañang security officials and the local police have made Mendiola a no camp out zone. Since December 6, Manila anti-riot police have been violently frustrating attempts by activists to set up camp at the historic bridge leading to Malacañang. Several youth protesters were arrested and injured in clashes with the police. At least five protest leaders were charged with sedition. The last time rallies at Mendiola were banned and considered seditious, the illegitimate President, Mrs. Gloria Arroyo, was desperately clinging on to power and suppressing protests at every turn. But President Benigno S. Aquino III is not fighting for political survival unlike his despised predecessor. In fact, he continues to enjoy high approval and trust ratings, according to the latest Pulse Asia survey. Thus, to some, it is puzzling how government is responding to the camp out protest. It is indeed quite uncharacteristic for a regime that supposedly has wide public support to be so insecure about a peaceful assembly. Police officials insist that their intel work indicates something unusual about the camp out. Their claims, however, are as preposterous as the fantastical “put the little girl to sleep”. Manila police officials, for instance, say they think the protesters plan to encircle Malacañang in a seditious act of toppling the government. This explains the repeated statements by police officials that the camp out is inciting to sedition. The police’s intel sources, by the way, are the media advisories and Facebook posts of camp out organizers and participants. The student and youth organizations which initiated what the mainstream media have described as the Philippine version of the “Occupy Wall Street” actually have a simple message, objective, and aim. The message is that the political and economic system favors the rich and exploits the poor. The objective is to concretize this message by raising urgent issues – the budget cuts in education, rising prices, lack of jobs, landlessness, etc. The camp out aims to mobilize more people around these issues and struggle for genuine change. Malacañang will not admit but what it worries is this: If the camp out will succeed, it will help weaken the plan of the Aquino clique to forever ride on the strong anti-Arroyo sentiment to sustain its legitimacy and wide public support. It will help the public see that the more fundamental contradiction is not Aquino versus Arroyo. No matter how noisy this conflict has been, the main contradiction remains between the exploited great majority of the people and the exploiting minority that both Aquino and Arroyo represent. 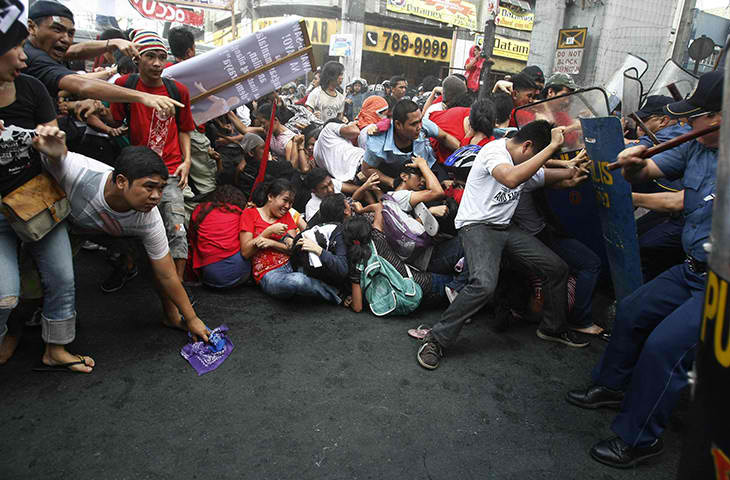 Government has dismissed early on an Occupy movement gaining ground in the Philippines. Presidential spokesperson Edwin Lacierda said in October that there is no basis for a similar movement as the administration is “siding with the poorest of the poor”. Government, he said, strives for “inclusive growth”. Nothing can be farther from the truth. In its December 6 editorial, the Philippine Daily Inquirer noted that the combined income of the richest 1% of the families (185,000) is equivalent to the poorest 30% (5.5 million). Aquino, like Arroyo, belongs to this 1% that monopolizes the country’s wealth. Economic policies favor the ruling elite to which both Aquino and Arroyo belong. They use political power to prevent the redistribution of social wealth and accumulate more. The most glaring example is the Hacienda Luisita, which has been controlled by the family of the landlord President for more than half a century through deception and violence. Today, Aquino wants compensation from farmers his family has exploited to the hilt for decades before they can get the lands they have always owned. It will not always take the form of an Occupy or camp out, but objective conditions indicate that social unrest certainly will intensify. Long-term trends in social indicators show a worsening crisis that is the result of decades of flawed, pro-elite economic policy making. Let us take a look, for instance, at the historical results of the surveys of the Social Weather Stations (SWS). From less than 10% in hunger incidence in the late 1990s, the portion of families that go hungry has jumped to more than 19% this year. Poverty remains unacceptably high at more than 54% this decade although it has declined from 61% during second half of the 1980s. From less than 10% in the last decade, unemployment has doubled to almost 20% in the 2000s. Meanwhile, in the countryside, landlessness continues to worsen. Using official data from the last Census of Agriculture in 2002, farms not owned by tillers comprised almost 53% of the total number of farms. In the 1991 census, it was a smaller 42 percent. A similar trend is observed in terms of total area of farms. During the same period, the share of farms not owned by tillers deteriorated from 33% to 49 percent. The camp out is by no means the be-all and end-all in exposing Aquino and the deep-seated crisis of our backward politics and economy. But winning the “battle for Mendiola” is also crucial in terms of the symbolisms that occupying the bridge represents. First is the assertion of our democratic rights as Mendiola has long been a symbol of the people’s struggle against tyranny. Second is amid the global crisis, occupying a public space has become a powerful symbol in many countries to show the people’s disgust with the prevailing system that benefits only the few.